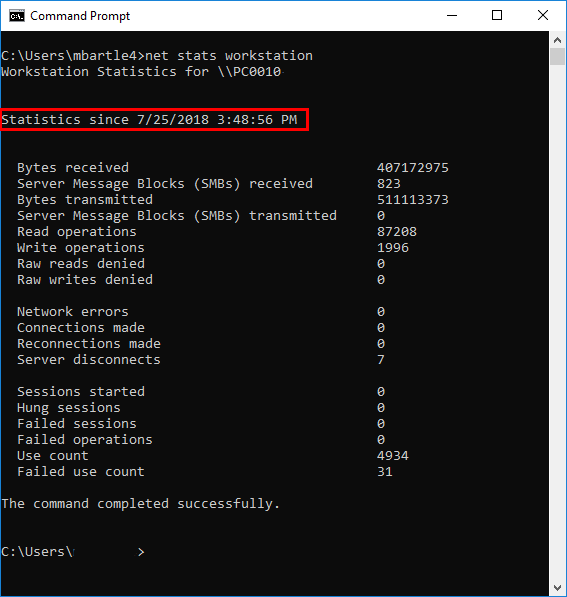 If you’re curious to see how long a Microsoft Windows 10 system has been powered on without a restart, you’ll want to learn how to see system uptime. This information is useful to system administrators if they want to see if a reboot has been applied to the system recently. You can do so using one of these two methods. Bring up the Task Manager by right-clicking the clock in the lower-right corner of the taskbar and selecting Task Manager. Alternately, you could press CTRL + ALT +Delete. Select the “Performance“ tab. If you cannot see tabs, select the “More details” option. You can see system uptime located toward the bottom of the window. This will provide you with a live time period on how long the system has been on. You can also see system uptime by using the command prompt. Type “net statistics workstation“, then press “Enter“. Toward the top of the output, there is a line that says “Statistics Since…” that will show the time the computer last came online. It provides other data too, such as sessions accepted, amount of data sent, system errors, and print jobs spooled. Similarly, the “net stats server” command can be used in server versions of Windows such as Windows 2016. Type “systeminfo“, then press “Enter“. A line labeled “System Boot Time” will be displayed. That’s all there is to it! If you have any other methods or information, feel free to share them in the comments section below. My Win10 Pro CPU Up time is currently 3d 4h 25m in Task Manager. The seconds are incrementing with real time. I shut down Windows at close of play every day. Why is the Up time not reset? A better shortcut to get the task manager is control-shift-escape. is it possible to have some wireless network issue, if win 10 laptop system up from 20 days and never rebooted ? 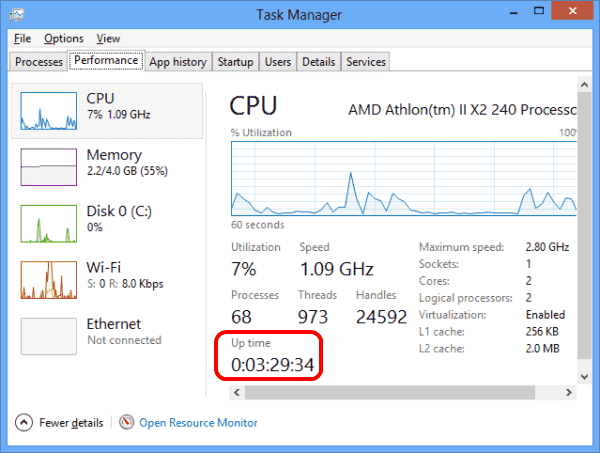 Note that uptime is only shown on the CPU info page of the Performance tab in Task Manager. It’s not shown for Memory or Disk. The solution using “net statistics workstation” does not always work. In my case, on my current Windows 10 system that reboot every day, the date and time displayed are 27 days in the past. 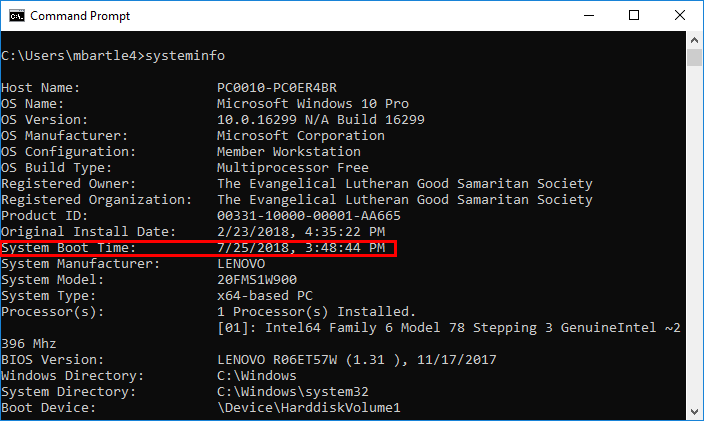 I remember that have used this method for a while in Windows 7 and it worked, but it seems that the statistics “span” goes over several days now, not just today or the last start-up time.